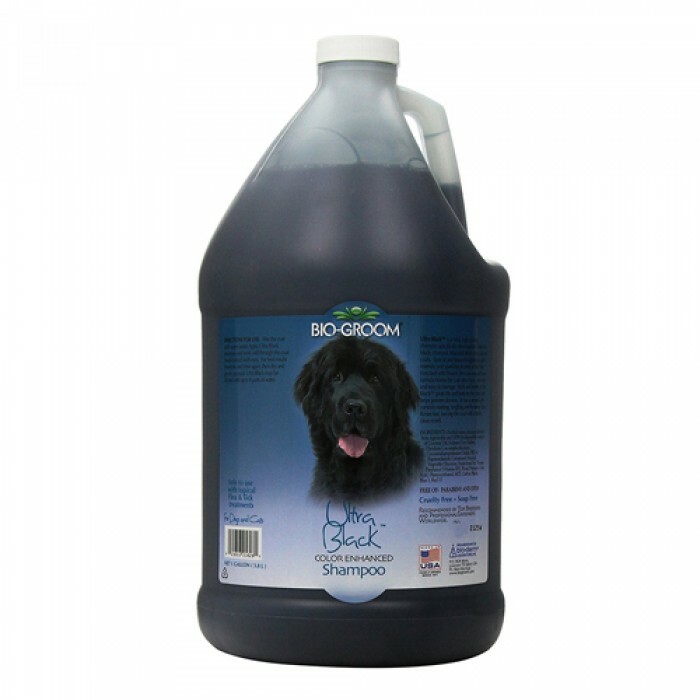 Product Information-The special formula of Bio-Groom ultra black shampoo contains pearlescent brighteners to intensify black and other dark-colored coats. Adds sparkling highlights and gives coats a rich, lustrous sheen. Mild coconut base is enriched with protein to add body and fullness. Ultra black shampoo rinses easily and leaves a fresh, clean scent. Dilutes 4-1Comes in a 995 ml. Direction for use - Shake well before using. Wet pets coat completely with warm water. Dispense a generous amount of shampoo into palm of hand and thoroughly massage into pets coat beginning at head and working back towards the tail. Avoid getting into eyes. Rinse completely. Repeat as necessary. Direction for use - Shake well before using. Wet pets coat completely with warm water. Dispense a generous amount of shampoo into palm of hand and thoroughly massage into pets coat beginning at head and working back towards the tail. Avoid getting into eyes. Rinse completely. Repeat as necessary. Measures 8-inch length by 2-inch height by 2-inch width.